Feeling anxious about leaving your furry pal alone at home during the holiday? Not to worry! Here are some helpful tips and reminders that you should consider about FunPaw’s Automatic Pet Feeder to guarantee a satisfying Thanksgiving for both you and your pet. Whether you are spending the holiday a couple blocks down over at Grandma’s or hopping on a plane to your parents’, distance should not be a factor in completely separating you from your best friend. 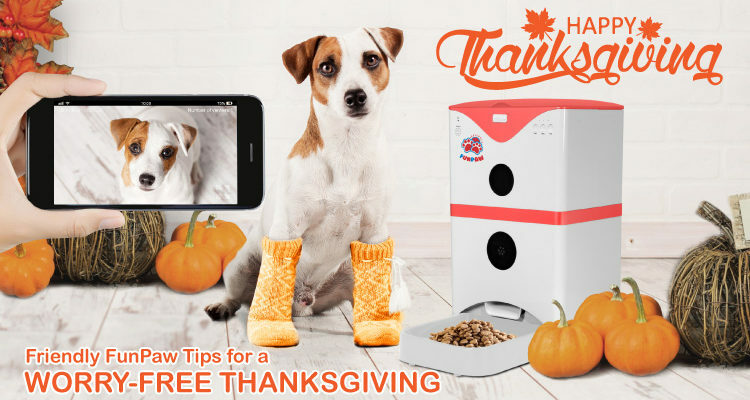 With the FunPaw Automatic Pet Feeder, you can connect to its app with your mobile device and instantly dispense your pet’s food while you’re riding a plane, shopping for groceries, or baking that turkey from the other side of the globe. If you are busy entertaining guests as the host for this holiday, set a schedule for automatic food dispensing with a simple tap of your finger. Although Thanksgiving Day entails the perfect occasion for binge eating, it does not have to mean the same for your pet. The FunPaw app provides you the advantage to regulate portion size for healthy eating habits. 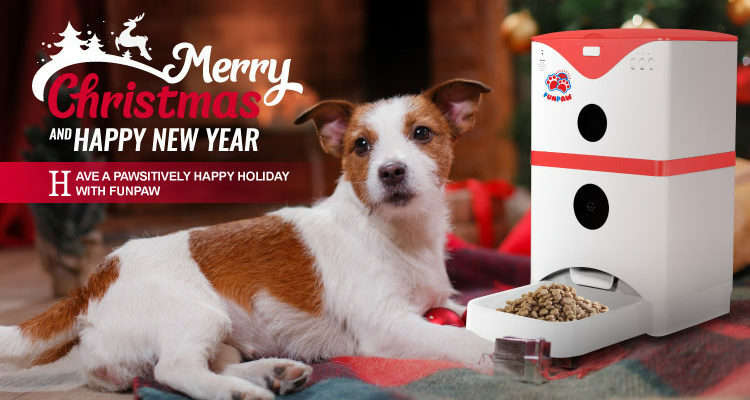 If your holiday involves you being away from home for one day or for an entire weekend, the pet feeder can store up to 13 lbs. of dry food, so that way your canines or felines can stay well-nourished with the right amount of food for an extended period of time. 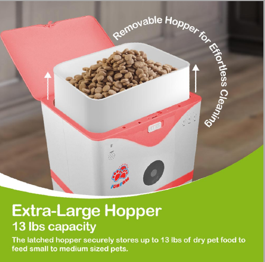 If you have more than one furry friend at home, easily adjust the portion quantity you wish to distribute into the feeding tray that carries the maximum of roughly 2.5 cups. If anyone is eating smart this Thanksgiving, it’ll definitely be your fur pal. One of the major highlights to a Thanksgiving holiday—besides the copious amounts of great food—is the quality bonding time being shared with friends and family. FunPaw firmly believes that these moments should definitely be shared with your beloved pets. 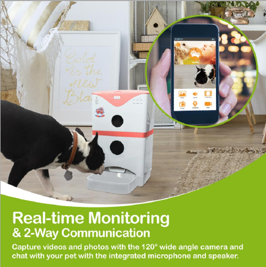 Featuring a built-in camera and microphone, the automatic pet feeder grants you the gift of two-way communication to close the distance between you and your pal during this warm holiday season. 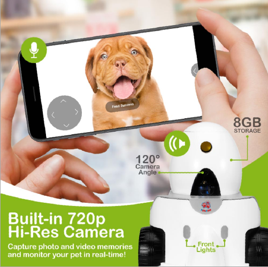 While you’re monitoring your pet’s status, your pet can be comforted by listening to its favorite human’s voice through the mic. You can never be too prepared when it comes to the quality care for your pet. 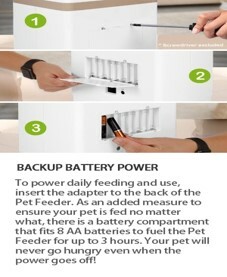 While the adapter of your FunPaw Automatic Pet Feeder stays connected, bump up your security measures by including a set of 8 AA batteries inside its battery compartment to keep it up and running in case of sudden blackouts at home. 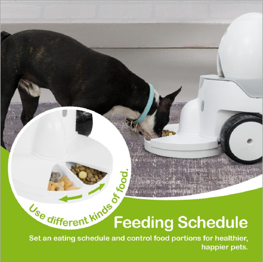 The batteries allows up to 3 hours of activity without its connected power source so that your pet won’t be skipping mealtimes. FunPaw wishes you and your pets a bountiful and fun Thanksgiving! © Copyright FunPaw 2017. All Rights Reserved.